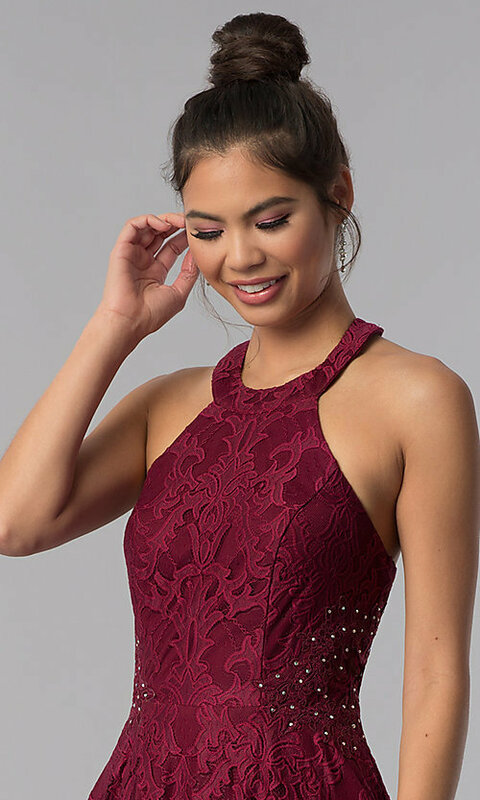 Simply adorable, this burgundy lace homecoming dress radiates poise and grace. The little red party dress features a fitted racer-front bodice with cut-in shoulders. Adding to the edgy look, two bands extend from the collar and drape over the open back to connect with the back of the sleeveless bodice creating a triangular cut-out detail. Adding a dash of sparkle for special events, rhinestones adorn the sides of the burgundy party dress. The short jersey-lined a-line skirt is supported by a second jersey lining trimmed in tulle for added volume. This junior-size lace homecoming dress, under $100, is ideal for school dances as well as wedding celebrations.